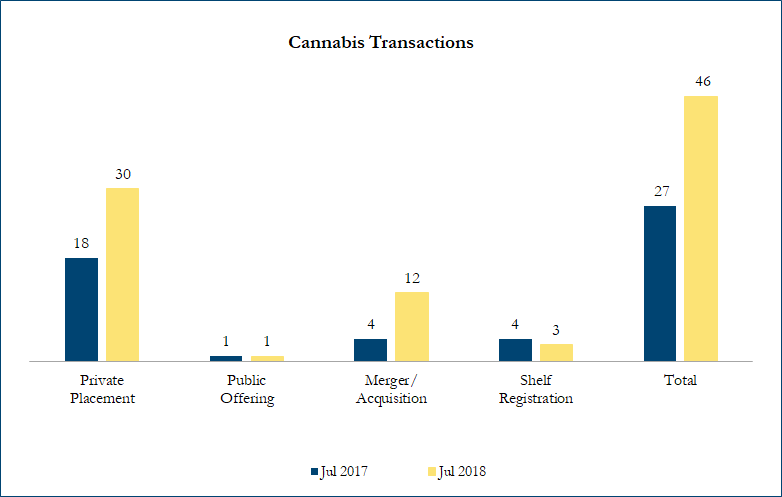 July 2018 Cannabis Transactions – Sinclair Range Inc.
On July 10, 2018, Canopy Growth announced the acquisition of Hiku Brands to expand its retail footprint for total enterprise value (EV) of C$340 million in an all share transaction. The offer represents a premium of 33% to 20 day volume weighted average price. The offer implies a multiple of EV/2019 EBITDA of 30.4x and EV/2020 EBITDA of 6.0x. Calculations include asset purchases and sales, joint ventures and minority and majority shareholdings that disclosed a transaction value and were announced within the time frame. Cannabis industry definition includes cannabis products producers as well as supporting industries such as suppliers, laboratories, and security, among others. Cancelled transactions were excluded from the morrowind-guide. Exchange rates based on historical figures.